Circuit: #403Classic Linear 5v Supply Using 6.3vac Transformer __ Circuit s designed by David A. Johnson, P.E. I got a call from an administrator at a large prison. He told me that he was having problems with inmates who keep unplugging refrigerators, vending machines and microwave ovens in a commons area. He wanted a battery-powered device, which could be mounted to the outside of the power cord of an appliance. The device would produce a loud alarm whenever the power plug of the appliance was unplugged from a power outlet. He said that the prison had an emergency backup generator, so if utility power were lost; their generator would kick in within a minute or two. He therefore did not need any automatic timeout after the alarm started. I gave this some thought and came up with the circuit below. A 9v battery powers the circuit below. Its standby power is so low that a 9v battery should last 5 years or so. A pair of copper strips pushed onto the surface of the power cord by the “clamshell alarm assembly” collects a tiny bit of voltage from the electric field emitted by the power line through capacitance coupling. A low power voltage comparator converts that voltage into a square wave signal. 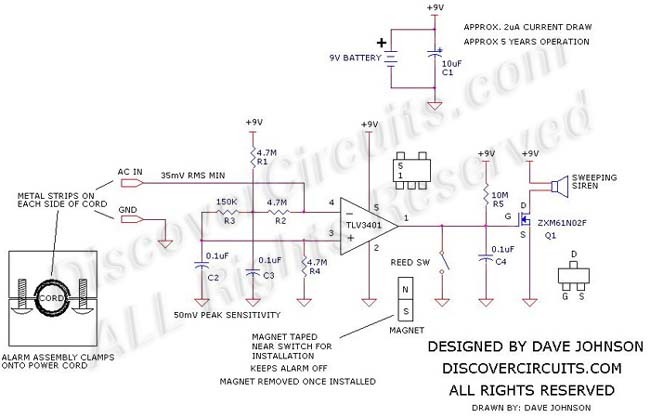 The open drain output of the TLV3401 comparator from Texas Instruments keeps the capacitor C4 discharged, when the circuit detects AC from the power cord. When the AC power is lost, the capacitor C4 is charged up through R5 and turns on the transistor Q1. Q1 then turns on the alarm. A piezoelectric siren with a sweeping tone is recommended as the alarm sound generator. Note that the circuit will not go into alarm if the appliance is turned off, since AC would still be present in the power cord. Only when the plug is removed from a power outlet will the device go into alarm. I also show how to use a small reed relay in the circuit during installation. By taping a magnet near the switch, on the outside of the plastic alarm enclosure, the alarm will be kept off.